I recently retired(630-08). 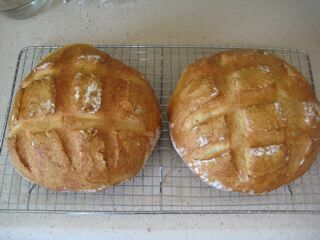 One of my hobbies was baking including bread baking. With all the distractions of married life and the job my hobby time was restricted. I like to home brew, garden, cook, read, woodworking, general physical fitness-walking, hiking etc. 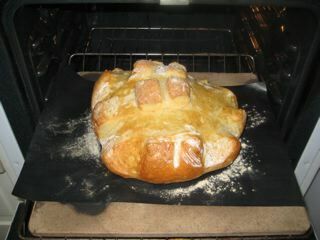 My time for baking was practically nil with all the other things taking their share of time. Now that I am retired I have been reading up recipes, techniques etc. 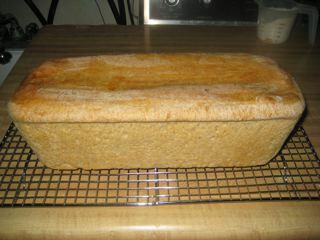 for bread making. I purchased S.F. Sourdough Starter and 2 Italian starters from Sourdough International. I have both starters active. 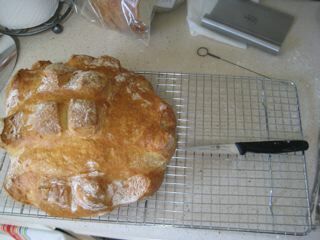 Although I have made French Bread before, I never shaped a Boule. Notice better scoring. I used a different tomato knife with long large serrations and I cut less deep with a smoother action. I think I am getting there. Thanks D.M. Snyder for the scoring tutorial. 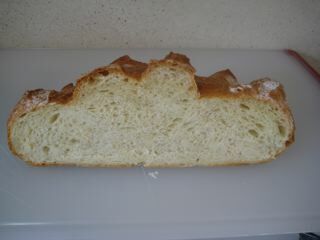 I didn't photograph the crumb this time, but is was similar to the first time. The texture and taste of bread was excellent(medium chewy. I employed some things I learned from previous baking. I also used a technique suggested on the forum a few times previously. I placed the teflon sheet on a cookie sheet. Then I opened the oven and pulled the rack with the baking stone out so I could easily grab hold of the teflon sheet and pull it on the stone. Parchment paper might work as well, but is not as strong as teflon. exposed corner of the very hot pan and quickly close the oven. when I cut and taste it. and tools. This is a great way for us all to become better bakers. I really like your editor on this site. It is very intuitive. Have fun with your hobby, now that you have time to indulge! Your scoring definitely improved between the first and second attempts. You might want to score even less deeply on your next attempt. You can also angle the blade so that it's maybe 30 degrees from horizontal, instead of holding it vertical while making the slash. Your panned sourdough appears to have over-fermented before going into the oven. If you were aiming for a nicely domed dough prior to baking, you probably want to adjust something. Either more dough for that size pan, or a smaller pan for that amount of dough would work. 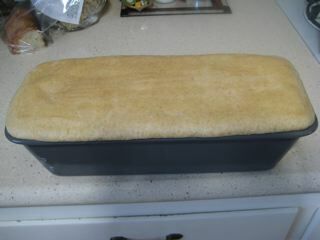 Ideally, you want to pop the bread into the oven before it is fully inflated, since it will expand further as it bakes. If it is already at its peak expansion when it reaches the oven, it will usually collapse while baking. Keep on experimenting. Every one of us has a few doorstops to our credit. The main thing is to figure out what happened and why, so that the next effort is better than the last. Have fun! Paul, thanks for the input. Paul, thanks for the input. I think I will try your suggestions on my next Boules. I have a lame so I might use it for one loaf and use the tomato knife I used for my 2nd boules for my 2nd loaf. I believe you are right about the sourdough. I knew I was in the double zone but I probably passed the peak. My sourdough was more domed when I glazed with egg white. If I was before the peak it probably would have restored the dome shape. Long proofing time and inexperience contributed to the problem. I am usually a rapid learner so I expect my breads to improve. I've gathered many good ideas on this site. Like in home brewing there are some that like to experiment with techniques and ingredients. I find this very interesting as well.